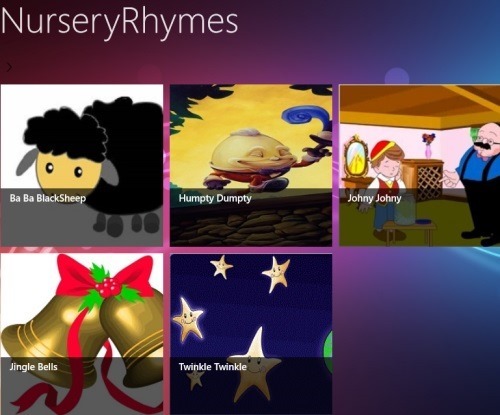 Nursery Rhymes Kids is a free Windows 8 rhymes app that brings you 8 different nursery rhymes. Here, you can find audio clips of all the 8 rhymes with their lyrics and a bit info about each rhyme. You need to scroll towards the right, in order to view the entire lyrics. Rhymes including Alphabet song, Five Little Monkeys, Itsy Bitsy Spider, I’m a little teapot, Ba Ba Black Sheep, If You’re Happy and You Know It, Twinkle twinkle little star, and Mary Had a Little Lamb are available for your kids to learn. You can play audio clip of all the rhymes, stop them, control volume, and more. The entire app is in the most popular International language i.e English. Let me quickly point out the main features of this rhymes Windows 8 app below. Brings you 8 different rhymes for kids to learn by listening to the audio clip. Lets you play audio clips using Play button, Stop using stop button, and resume to continue playing. Lets you control volume using the volume icon. Comes with lyrics of the rhymes, audio clips of the rhymes, and a bit info all the rhymes. You do not need to have Internet connection to play audio clips. All in all, Nursery Rhymes Kids is a good educative app for kids to learn in a play-way method. Go ahead and download Nursery Rhymes Kids app in Windows 8 now. Nursery Rhymes is another rhymes Windows 8 app especially designed for preschoolers, toddlers, babies, and kids of all age group. This app comes with a beautifully animated video along with audio clips of the rhymes with excellent sound quality. Nursery Rhymes app helps kids to develop their listening skills, improves phonemic awareness, pitch, and more. Listening to rhymes while watching animated videos makes kids to memorize things easily. Although, there are 8 different rhymes that are available, however, only three can be played for free. You need to pay a small amount to in order to get the rest of the other rhymes started. Let me quickly point out the main features of this Windows 8 rhymes app below. Comes with 8 different rhymes: out of which only 3 are free. Comes with lyrics to understand the rhyme easily. Well.. I really found the video and audio quality of this Windows 8 rhymes app excellent. It, definitely, will attract your kids towards learning rhymes and improving their phonemic awareness. 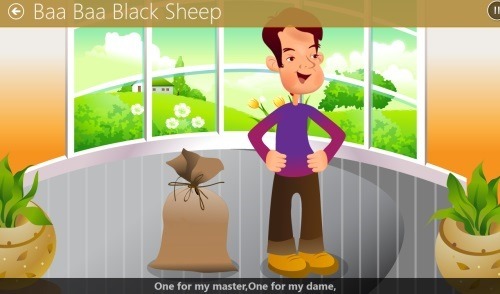 Go ahead and download Nursery Rhymes app in Windows 8. Nursery Songs comes with a large collection of beautiful rhymes, songs, poems, especially designed for your kids. Its, basically offers lyrics of popular nursery rhymes along with the pictures that make your kids to learn in a play-way method. 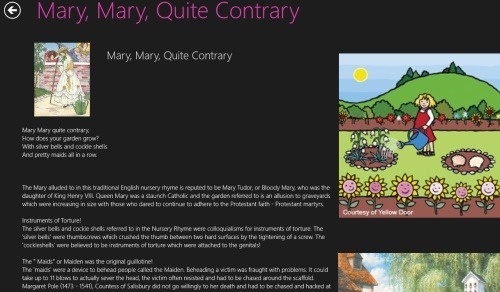 The interesting part about this Windows 8 rhymes app is that it contains the history and origin of each nursery rhymes, and the reason behind the lyrics of the each opened rhyme. You need to scroll down, in order to view the entire lyrics of the poem along with its description. There are 10 different rhymes including Ring a Ring o’ Roses, Marry Had a Little Lamb, Mary Mary Quite Contrary, Rock-a-bye Baby, London Bridge is Falling Down, and more. It’s very easy to use rhymes app that needs no Internet connection for viewing the lyrics of the rhymes. All you need to do is just download the app and get started with it. Go ahead and download Nursery Songs app in Windows 8 now. Ending my short post with Nursery Rhymzz that contains 5 popular rhymes designed especially for kids. It’s an elegant rhymes app for kids, its playful, kids can enjoy listening to their favorite songs and the best part.. it includes lyrics of each rhyme which becomes easier to understand the rhyme. You can play the audio clip using ‘Play’ button, stop it using ‘Stop’ button, and pause it using ‘Pause’ button. The interface of this app comes in vivid colors, and humongous fonts that attract kids and make them watch them as many time as they want. It’s a must trial Windows 8 rhymes app. Go ahead and download Nursery Rhymzz app in Windows 8 now.